Thanks Kiwi Jay, Rob still looks the same age this season. and now, follow this link to see all the commentary and Jeff's cast assessment etc! CBS ANNOUNCES THE 20 FORMER CASTAWAYS WHO WILL RETURN TO SEEK REVENGE AND REDEMPTION ON "SURVIVOR: HEROES VS. VILLAINS"
Twenty former castaways will return to compete on SURVIVOR: HEROES VS. VILLAINS when the 20th installment of the Emmy Award-winning series premieres with a special two-hour episode, Thursday, Feb. 11 (8:00-10:00 PM, ET/PT) on the CBS Television Network. SURVIVOR: HEROES VS. VILLAINS will reunite some of the most memorable, heroic and controversial castaways from previous SURVIVOR seasons. The series' best strategists will face off in their attempt to overcome — or embrace — the label placed upon them when they return to seek revenge or redemption, all in an effort to win the title of Sole Survivor. These unforgettable castaways will compete deep in the South Pacific on the breathtaking island of Samoa and will be divided into two tribes of 10 comprised of the best HEROES and biggest VILLAINS ever to play the game. The HEROES have been defined by their decisions of integrity, courage and honor, while the VILLAINS have mastered their skills of deception, manipulation and duplicity. Hometown: Christoval, Texas Hometown: Boston, Mass. Current Residence: Los Angeles, Calif. Current Residence: Los Angeles, Calif. Hometown: Kalispell, Mont. Hometown: Los Angeles, Calif.
Current Residence: Los Angeles, Calif Current Residence: Los Angeles, Calif. Hometown: Baton Rouge, La. Hometown: Boston, Mass. Current Residence: Los Angeles, Calif. Current Residence: Pensacola, Fla. Hometown: Braircliff, Glenolden, Pa. Hometown: Atlanta, Ga.
Current Residence: Philadelphia, Pa. Current Residence: Los Angeles, Calif. Hometown: Samson, Ala. Hometown: Stamford, Conn.
Current Residence: Mobile, Ala. Current Residence: Fayetteville, N.C. Hometown: New York, N.Y. Hometown: Susanville, Calif.
Current Residence: New York, N.Y. Current Residence: Susanville, Calif. Hometown: Fayetteville, N.C. Hometown: Boston, Mass. 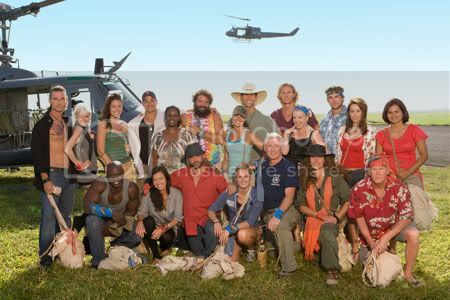 The SURVIVOR premiere will be preceded by a one-hour special, SURVIVING SURVIVOR (working title), on Thursday, Feb. 4 (8:00-9:00 PM, ET/PT), revisiting some of the greatest moments in SURVIVOR history and following up on life after SURVIVOR with some of the most memorable castaways. The special, executive produced by Susan Zirinsky for Eye2 Productions, contains fresh interviews with SURVIVOR favorites and offers a sneak peak at the new HEROES VS. VILLAINS. I'm actually loving this cast alot, I am even happy for a Danielle-Candice return. I am thinking our two hour premiere is not like Gabon which was 2 episodes in 1 but just 1 episode in 2 hours. Apparently there is both a reward and immunity challenge within the first 3 days possibly on Day 2 and 3 judging by the photo's below. Photo 3: Immunity Challenge, Combination of Previous Immunities (All-Stars etc), where 5 people paddle out and retrieve fire, 4 do a puzzle and 1 lights wok at the end? Thank you Will and Kiwi for the excellent updates and photos!!!!!!!!!!!!! The last photo looks like the "puzzle boats" from Cook Islands. Loved the female heroes - Amanda, Cirie, Sugar and Steph. Where's Sierra, Taj, Shambo, to take over Candice? The male villians are perfect for this season. The female villians... Sandra and Parvati ain't really villians? Where's Corrine! The male heroes... don't know why Tom and James made the list over good winners like Yul and Earl or even other players like Yau-Man or even.. Bobby Jon. 75% happy with the cast. ROOTING FOR HEROES!!!!!!!!!!!!!!!!!!!!!!!!!!!!!! GO FEMALE HEROES!!!!!!!!!!!!!!!!!!!!!!!!!!! Well, Tom made for a good hero, but I agree that Yul should be in there instead of James! Incidentally, I think Shambo was approached for S20 but refused. Just as well -- she can't strategize her way out of a wet paper bag! Tom = great addition to the cast. I love everyone apart from 1 thing. Why is Danielle on Villains and Candice on Heroes, swap them puhlease. Yau-Man, man I hope he comes back for a third. Without Cirie, mind! haha. Sandra and Parv are villains. Watch Pearl Islands again! and Parv in Micronesia can be a bit of a villain. We're missing Danni Boatwright too.